Have you ever wanted to just get all of your ticket notifications within the Zendesk Support agent interface itself? 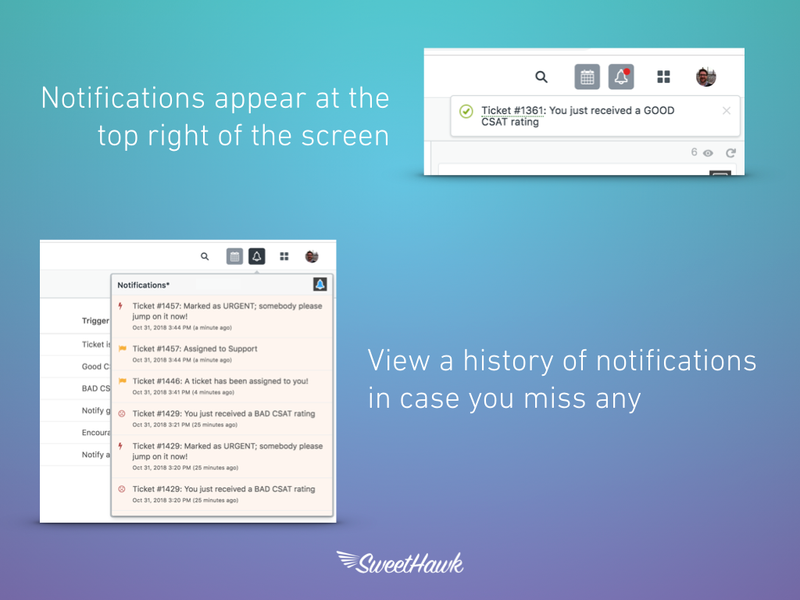 Rather than clogging your email or Slack feeds with Zendesk Support messages which require you have to click away from your Support browser tab only to come back to it, the Notify app gives you the option to have any ticket events you define pop up in the top right corner. 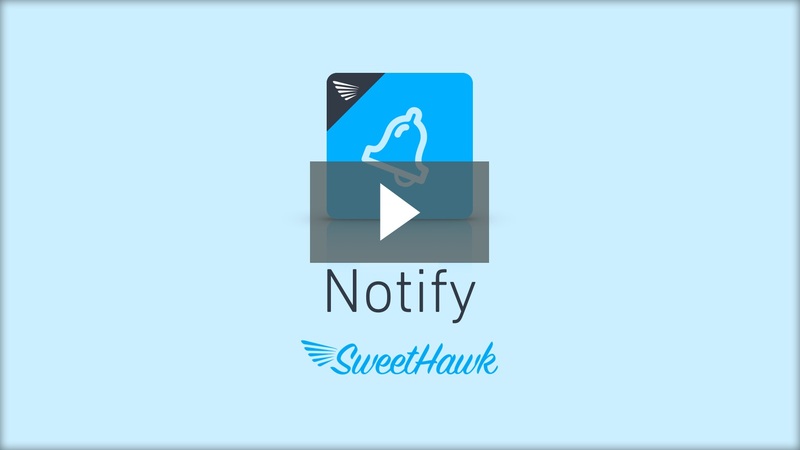 As an admin, you define the details of the notification you want your agents to get. You specify the content, icon, importance and who should get it. 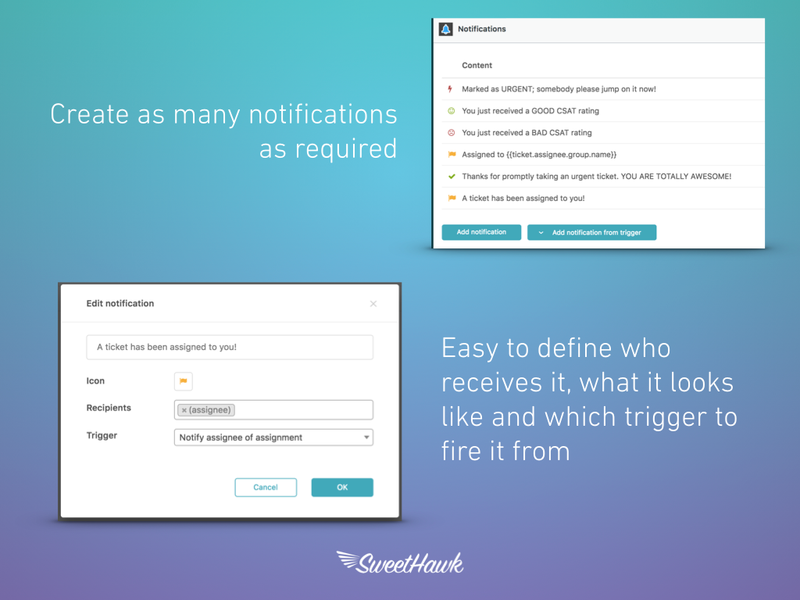 Connecting the notification to a trigger or automation is extremely easy: this is done by simply making a selection from a drop-drown, no need to go into triggers and modify them manually. We even provide you with a shortcut to add notifications to triggers/automations that have a group or user email setup on it currently, and pre-populate it with appropriate values as a starting point. So whether your use case is around preventing SLA (Service Level Agreement) breaches, turning bad satisfaction ratings into good ones, getting notified when a VIP submits a ticket or you have custom timing workflows using automations or time-based apps like Calendar, Deadline or Timers. This app will keep you and your agents on the ball and avoids the need to leave the Support tab! Built by SweetHawk. 14 day free trial included. Free for sandbox accounts. Welcome to the Notify app. It lets you set when and who a notification is shown to and you can even set what they look like. Ok, Let's see how easy it is to set up a notification to tell agents when they been assigned a ticket. We just go to the notifications tab on the right and click 'add notification'. Put in what we want it to say. Then we define what colour it will appear as and an icon associated with it. Next, we set who will see it. In this case, we’ll set it to the ticket assignee, but if we wanted to this could be set to any specific user, all users, a group or a combination groups and users. Finally, we define when we want the notification to pop up. This is done by attaching it to an existing Zendesk trigger or automation. So when the trigger fires, the notification also fires. In this case, we’ll select the existing trigger called “Notify assignee of assignment”. 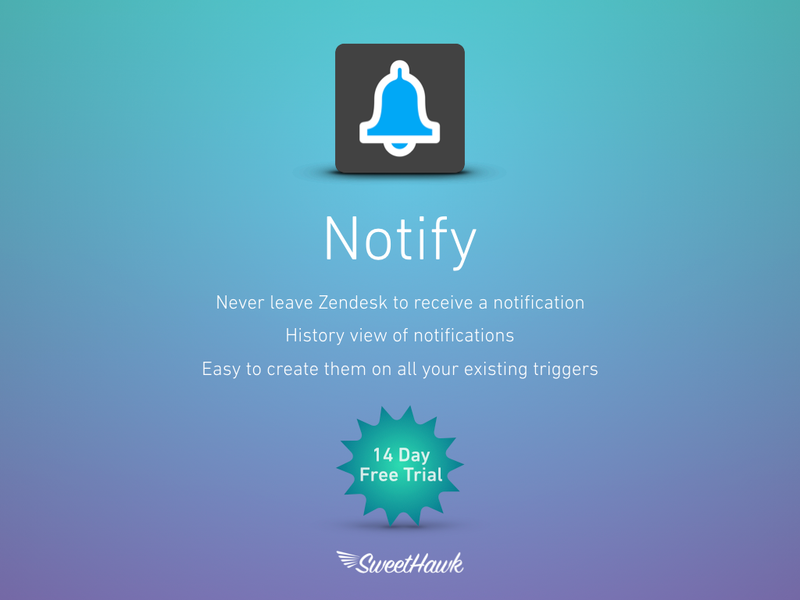 Now, for any trigger that sends an email, you’re probably going to want a Zendesk notification for, so we’ve pre-populated a list of email sending triggers that you can quickly add notifications to with a couple of clicks. Ok, let's test out the notification we just built. We’ll assign this ticket to Jeff. And if we pop over and look at what Jeff sees, we can see at the top right he’s now receiving the notification. And if he misses it, no problem! A little red dot appears on the icon at the top letting him know he has unread notifications. All he needs to do is click, read and pow he’s on the job. So whether your use case is around preventing SLA (Service Level Agreement) breaches, turning bad satisfaction ratings into good ones, getting notified when a VIP submits a ticket or you have custom timing workflows using automations or other SweetHawk time-based apps like Calendar, Reminders, Deadline, Due Time or Timers. This app will keep you on the ball and never having to click away from Zendesk for a notification again. To activate your 14 day free trial, install the app and enter your payment information. We won't charge your card until the end of your trial.